Computer hobbyists has been building their own desktop computers since the mid 1980's, but I know of no laptop kits, until now. 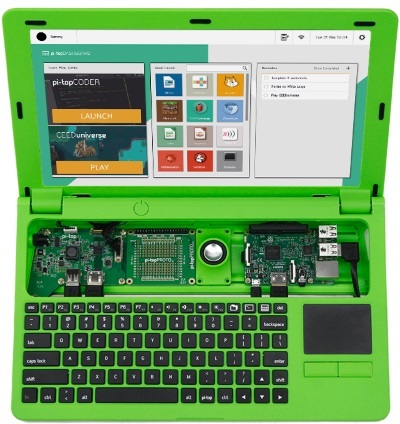 The Pi-Top is a kit that lets you build your own laptop computer. The Pi-Top mother board is the Raspberry Pi, which is an open source design that uses the Broadcomm SoC (System on a Chip), which runs many of the main components of the board–CPU, graphics, memory, the USB controller, etc. The laptop case comes with a screen, base top, base bottom, and the Pi-Top Hub PCB to take care of power management, the screen driver, and more. The Raspberry Pi itself is not included because there are several different versions with different technical power. A Raspberry Pi 3 is the best Pi to match up with a Pi-Top laptop kit. The Raspberry Pi was designed for the Linux operating system, and the most popular Linux distribution for Raspberry Pi is Raspbian, which is based on the Debian operating system. Raspbian comes with the LXDE desktop environment, which lets you use most Linux compatible GUI applications. If you want a more glitzy desktop, you can use Pixel which has improved appearance such as icons, themes, and wallpapers, etc., and a couple of new applications which are helpful to turn Wi-Fi or Bluetooth, on or off. You can run Windows 10 on the Pi, but not the standard desktop version with a graphical interface and Microsoft Word and Internet Explorer. These are incompatible with the Pi's ARM-based hardware. You'll need to use Windows 10 IoT Core, a slimmed-down version of the OS aimed at Internet of Things (IoT) devices. Windows 10 IoT Core can be downloaded for free. Screen - 13.3 inch 1366 x 768 resolution LCD screen connected by simply slotting the metal hinge into the base bottom piece. A single cable is plugged into the Pi-Top Hub. Keyboard - 82 key keyboard. Fully reprogrammable. UK and US vinyl layouts available. Trackpad - PalmCheck feature helps prevents unwanted mouse clicks. Battery pack - Smart Battery pack. Battery life: 10+ hours. Hub - The Pi-Top Hub PCB provides mounting rails for securely fastening these extras like a hard drive or other hardware. The Pi-Top Hub PCB takes care of power management. Memory - The Raspberry Pi has a gigabyte of RAM, and the microSD card has only 8GB of memory. You can replace the microSD card with one with more memory. Cables - Cables for connecting all the pi-top pieces. Charger - Over–current, over–voltage, over–temperature and short–circuit protection. Charge balancing for extended lifetime. Instruction booklet - The Pi-Top comes with complete instructions on how to assemble the laptop, and you'll find many independent step-by-step Pi-Top assembly guides online.